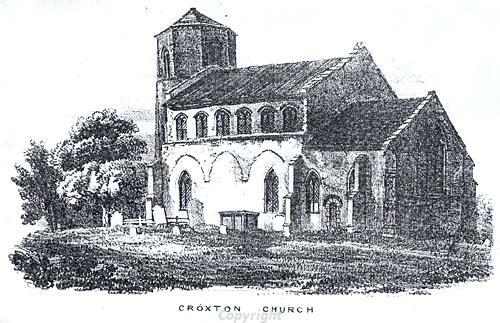 The parish of Croxton is situated in the deep south of Norfolk, just northeast of Thetford. The area is mainly forested heathland, settlement being largely in the south of the parish. The origin of its name comes from the Old Norse for ‘Krokr’s Enclosure’, and the parish was already an established settlement by the time of the Norman Conquest, its productive capacity, population and land ownership all detailed in the Domesday Book of 1086. The earliest indication of human activity in the parish comes in the form of prehistoric flint tools, and evidence of their manufacture. An example of the former is flint flakes (NHER 15366), and the latter a flint working site (NHER 30421). The first flint finds that can be dated come from the Mesolithic, and comprise a microlith (NHER 19526) and an axe (NHER 30477). Far more flint finds come from the Neolithic, and tools found in the parish from this period include chipped axes (NHER 5702), polished axes (NHER 5706), arrowheads (NHER 5705), scrapers (NHER 14036) and a laurel leaf point (NHER 14573). The parish is unusual in that evidence of early activity is not confined to flint tools. There are actually the remains, though fragmentary, of two possible prehistoric trackways. The Icknield Way (NHER 1398) was part of a probable trackway running north through the parish on its way to the north Norfolk coast. East Harling Drove (NHER 5435) was a similar arrangement, but running east to west. Both these trackways continued in use up to the medieval period and possibly later. A note of caution is advisable though, as there is some current debate on the trackway’s designation as prehistoric. The only monument to survive in the parish thought to be from the Bronze Age (it might be Saxon) is a relatively undisturbed round barrow on Mickle Hill (NHER 5707) on Croxton Heath. Bronze Age flint arrowheads have been found (NHER 5700, 5706 and 14574) as well as a copper alloy palstave (NHER 11253), a stone axehammer (NHER 11800) and a dirk (NHER 36075). Surviving Iron Age objects are usually quite rare, and in this parish consist of some pottery fragments (NHER 29317), a coin (NHER 31834) and a couple of brooches (NHER 30274 and 37327). The Roman occupation has left no traces of any buildings, but quite a number of coins have been found (e.g. NHER 12395 and 16472), together with pottery fragments (NHER 29317) and brooches (e.g. NHER 31834 and 31981). Saxon finds are likewise confined to small objects, and include a pair of tweezers (NHER 30033), a brooch (NHER 24859) a pin (NHER 31834) and a strap end (NHER 31906). The medieval period following the Norman Conquest has left the parish with its oldest surviving building, All Saints’ Church (NHER 5743). This attractive church has a round tower and priest’s door that date back to the late 12th century. The tower is topped by a 14th century octagonal belfry with a small Victorian spire. The rest of the building is 14th century and later, restored in the 19th century. Inside can be found a 15th century font, a fine hammerbeam roof and a remarkable World War One memorial. No other medieval buildings survive, but documentary sources indicate that there was a hospital in the parish, founded in 1250 (NHER 14542), although no trace of it remains today. Also found has been a medieval well (NHER 15631). All the other medieval material found in the parish comes in the form of small finds, such as coins (NHER 24859 and 24860), pottery fragments (NHER 29317 and 30421), buckles (NHER 24859 and 31234), a jetton (NHER 29981), a padlock (NHER 30704) and a key (NHER 31905). Some medieval stone has been found reused in post medieval buildings. It is not clear where this old stone originated, but it may have come from Thetford Priory after the Dissolution of the monasteries, or possibly from the demolished aisle of All Saints’ Church (NHER 5743). Chapel Farm (NHER 15056), a 17th century house, contains reused medieval stone, as does the 19th century house at NHER 15055. The only evidence of post medieval industrial activity is a tile kiln (NHER 14002), which is marked on 19th century maps. However, this was demolished in 1940, and nothing remains today. Moving on to the 20th century, two World War Two pillboxes survive, part of the anti invasion defences of the time (NHER 15053 and 15054). The comparative scarcity of buildings on the archaeological record is no doubt due to the mainly heathland landscape, but the extensive nature of finds show there has been human activity here through every period since the Mesolithic.